Getting Lost in Venice… On Purpose! 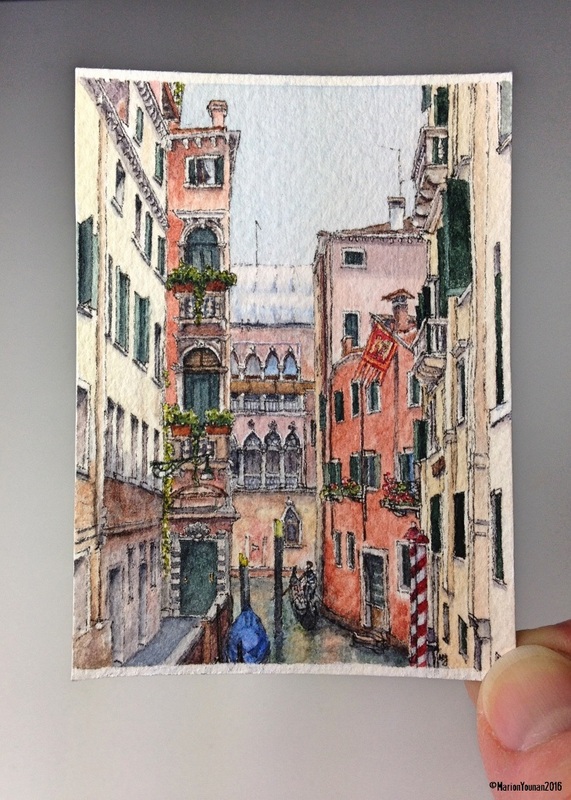 For Mini Vacations miniature #20, you can see that I’m still wandering around Venice (and will be for a few more pieces)! Venice is a very confusing place to wander in IF you like to rely on street maps. There are twists, turns, confusing street signs, nothing’s to scale… I spent most of my first day on my 2007 trip with my head down glued to the map , face scrunched up, trying to figure out where we were. It wasn’t pleasant! By day 2, I knew the map needed to go back in the bag, and my friend and I needed to just walk and let our curiosity guide us. We walked for hours. We reached dead-ends. We were on many streets without tourists. We ate a gelato alongside a quiet canal, no one in sight. We smelled lots of delicious home-cooking wafting out of windows. When we discovered a beautiful street, it felt like we had chanced upon a gem, a little-known secret gem. Like the canal street used for this piece. Even with the plastic covering and scaffolding on the building at the end of the calle, it still looked like a fairy tale. Even when a man came out of one of those fairy tale buildings in a business suit with a briefcase, likely on his way to work, we joked it could have been James Bond! Our feet eventually gave up, aperitivo time beckoned, and finally the street map come out of my bag. In retrospect, it was so much fun getting lost that day, but unfortunately, I have no idea where this beautiful canal street is! SO beautiful!! I am missing Italy… haha, like always.! Hi Sheryl: I’m missing Italy too. Sometimes painting an Italian scene is enough to quiet the longing temporarily, but sometimes it just makes the longing stronger! Oh well! Aahh, I’m glad you put the map away! Adventure. I like the sketch in this piece too. Glad you liked the piece, Janina! It’s great to be in a place long enough where “getting lost” can be a part of the experience, rather than dashing from one sight to another on an agenda. And there needs to be sketching time, too, so I find I’m travelling much less ambitiously these days. What about you?